A number of the city's trendiest hotels offer exclusive rooftop pool decks and beach clubs, featuring heated pools with expansive views of the city's majestic skyline. 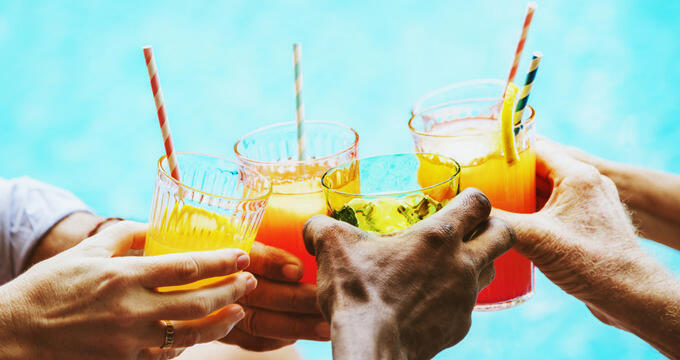 Many hotels offer non-guest access to pool decks for an additional fee, including access to sundecks and lounges, cocktail bars, and poolside restaurants helmed by award-winning chefs. Others are exclusive to hotel guests, offering a chance for tourists to soak in luxury high above the city's bustling streets. Jimmy at the James is the rooftop bar of the James New York SoHo hotel, a luxury boutique hotel chain also offering a location in Manhattan's up-and-coming NoMad neighborhood. The bar is the vision of hospitality industry veterans Johnny Swet, David Rabin, and James Beard Award winner Thomas Schlesser, striving to reinterpret classic pubs with an infusion of 1970s Manhattan flair. It sits 18 stories above ground level, featuring floor-to-ceiling windows offering stunning panoramic views of Midtown and the Hudson and East Rivers. During the warmer months, a rooftop pool area is opened, featuring a teak wood deck, outdoor showers, and indoor and outdoor pool deck lounge areas. Craft cocktails are served at a central bar, offering twists on old-fashioned American favorites. 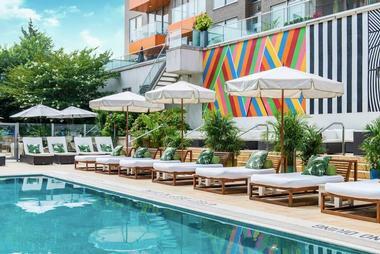 McCarren Hotel and Pool is located in Brooklyn's trendy Williamsburg neighborhood, serving as a trendy oasis within the borough for visitors looking for an immersive luxury experience. 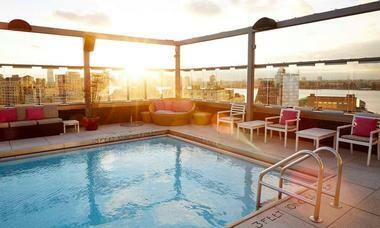 Its rooftop bar and pool deck offers one of the city's largest outdoor heated swimming pools, located on a 4,800-square-foot rooftop deck overlooking the East River. Walk-in day pass reservations are available 48 hours in advance of desired use date during the summer months for pool and deck use during the afternoon hours, offering access to towels, wifi, and sunbeds. 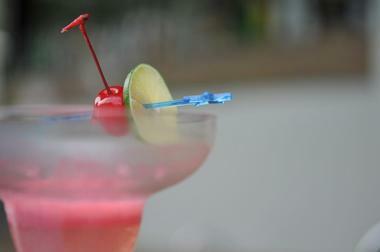 A lively rooftop bar also serves classic cocktails and offers a Sunset Happy Hour. 1 Hotel Brooklyn Bridge is a hip hotel overlooking Brooklyn Bridge Park, named to Conde Nast Traveller UK's 2017 Hot List as one of the city's best deluxe accommodations. It features sustainable decor elements created by local artists from native greenery and reclaimed materials, showcasing organic cotton mattresses and sheets in all of its spacious guest rooms. Its 1 Rooftop Garden and Bar offers unparalleled views of the Brooklyn Bridge and the Lower Manhattan skyline, serving light bites and bespoke cocktails daily from noon to midnight with reservations. 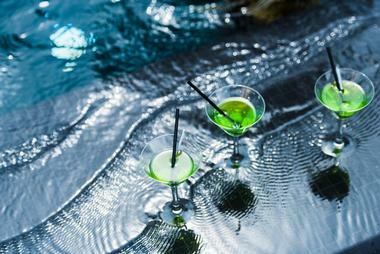 A rooftop plunge pool is also offered seasonally as an exclusive for hotel guests, serving craft cocktails poolside. Hotel Indigo, located in Manhattan's Lower East Side, offers a 15th-floor rooftop bar and pool operated by hospitality industry luminaries Gerber Group, the proprietors of the Whiskey Blue, Irvington, and Kingside brands. The nightlife spot was designed by acclaimed firm Crème Design, striving to recreate the ambiance of an artist loft through the use of reclaimed material decor elements and free-hanging lights. The 3,000-square-foot space offers an open-air rooftop swimming pool offering beautiful views of the city's skyline, along with ample guest space for lounging. Its restaurant serves American fare made with locally-sourced ingredients, while its bar offers an extensive menu of small-batch spirits, regional craft beers, and signature Gerber Group cocktails. Cold-pressed juices and Irving Farm Coffee Roasters coffee are also served. Dream Downtown is located in Manhattan's trendy Chelsea neighborhood, less than a mile from Union Square. The luxury hotel offers loft-style rooms with LED televisions with streaming VEVO channels, large minibars, and recessed audio speakers throughout rooms, with suites upgrading to private hot tub terraces. All guests receive access to the hotel's 5,000-square-foot beach club-style pool deck, which is centered around a 50-foot heated glass-bottom pool overlooking the hotel's lobby. The deck also showcases Manhattan's only sand beach, along with private-use cabanas, a full-service bar, and a DJ booth. Some deluxe suites offer direct in-room access to the beach club and pool deck facility. Gansevoort Meatpacking NYC is the first full-service luxury resort in Manhattan's Meatpacking District neighborhood, offering 186 stylish guest rooms and suites that offer breathtaking views of the Hudson River. The hotel, which was opened in 2004, is located close to top New York attractions such as the High Line and the popular Chelsea and West Village cultural districts. Rooms offer amenities such as LCD televisions, bay window seating nooks, and private balconies. The hotel is home to the Plunge Rooftop Bar and Lounge, which features a full-service bar and grill and a 45-foot heated rooftop pool decorated with underwater lighting. Other onsite dining options include New American restaurant The Chester, which offers al fresco dining experiences. Hotel Americano is a 10-story boutique hotel designed by Mexican-born architect Enrique Norten, located within walking distance of attractions such as Chelsea Market and the High Line. 56 spacious guest rooms and suites are offered at the hotel, offering elegant amenities such as custom alpaca throw blankets, hyperfast wireless internet service, and in-room minibars. Its La Piscine rooftop pool and restaurant is available to both hotel guests and non-overnight visitors for weekday use for a fee. Complimentary towels are provided for all swimmers, with private cabanas available for rental. Upscale coastal Mexican fare is served at the poolside restaurant, including tostadas, tacos, and craft tequila and mezcal cocktails. Le Bain is located atop the Standard Hotel, an 18-story tower hotel overlooking the recently-renovated High Line Park in Chelsea. Its top floor and rooftop area is home to the Le Bain penthouse discothèque, which features guest sets from world-renowned DJs and boasts a state-of-the-art lighting and sound system. A heated plunge pool adorns its dance floor during the summer months, with waterbeds and a crepe station offered atop its rooftop deck. Visitors should note that admission is not guaranteed to hotel guests and is determined at entrance, with advance reservations not accepted. Other hotel attractions include a seasonal ice skating rink, an art gallery, and a beer garden. 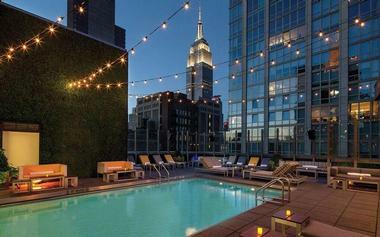 Le Parker Meridien is the rooftop pool of the Parker New York Hotel, which is located less than three blocks from Central Park near Carnegie Hall and the Museum of Modern Art. Floor-to-ceiling windows surrounding the pool provide dramatic views of Central Park, with an outdoor sun deck also available for tanning. A rooftop bar offers a full menu of light bites and cocktails for pool guests, with day passes available for purchase for patrons not staying overnight at the hotel. Several other restaurants are offered onsite, including the casual Burger Joint, the inventive Indian Accent, and coffee and cocktail shop Knave. 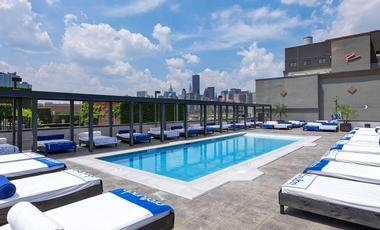 Profundo Day Club is an urban oasis in the middle of Long Island City, offering a spacious rooftop pool and exclusive day club open to the public during the summer months at the 9,500-square-foot boutique Ravel Hotel. Day passes are available for pool use throughout the day, with discounted pool rates available for hotel guests. Pool use is restricted to guests ages 21 and older, with all patrons required to present a government-issued ID for entry. A full-service bar and restaurant is offered, serving menu items such as sushi, Impossible burgers, fish tacos, and barbecue wings. Craft cocktails and pitchers are also served, along with an extensive wine and beer menu. World-renowned guest DJs are showcased, spinning dance music hits from around the world. Royalton Park Avenue is an upscale hotel located within Manhattan's NoMad neighborhood, conveniently located near the Empire State Building and Madison Square Garden. 249 luxurious guest rooms and suites are available for rental, featuring amenities such as loft ceilings, private balconies, and floor-to-ceiling windows. A rooftop pool is available for exclusive guest use during the summer months, open daily throughout the morning and afternoon hours. The connected Rooftop at Royalton Park Avenue restaurant and bar serves brunch and cafe menus, featuring clever dishes such as Nutella French toast, seared ahi tuna, steak tacos, and tempura shrimp skewers. A tri-level sundeck is also offered, serving evening cocktails and featuring seating for up to 180 guests. Sixty LES Hotel is located in Manhattan's Lower East Side neighborhood near cultural attractions such as the Lower East Side Tenement Museum. The upscale hotel showcases artistically-curated rooms and suites with flat-screen televisions, gourmet minibars, rainfall showerheads, and floor-to-ceiling views of the East River. 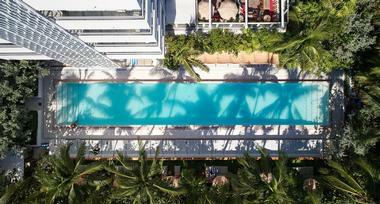 Its elegant 1,890-square-foot rooftop pool is open to guests only, featuring an underwater sound system, a portrait of Andy Warhol along its pool floor, and a retractable roof for use in inclement weather. 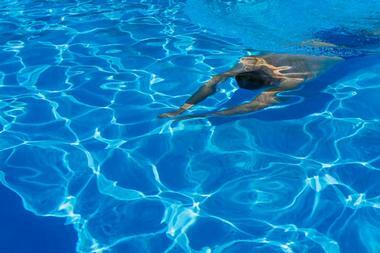 The pool is open daily between May and September and hosts weekly special events for guests. Full drink and small plates service is provided by Blue Ribbon Sushi Izakaya, and rental cabanas may be reserved for use by up to eight people. The William Vale is an upscale, full-service hotel located in Brooklyn's hip Williamsburg neighborhood, a short walk away from popular destinations such as the Brooklyn Brewery and the Bedford Avenue shopping and dining district. The hotel displays works from local Brooklyn artists including a large-scale lobby mural created by Marela Zacarias. Luxurious rooms offer balconies with expansive views of the Manhattan skyline and contemporary furnishing and design elements, such as custom metal work details. A 60-foot outdoor pool, Vale Pool, is located on the roof of the hotel and is the longest outdoor pool in Brooklyn and the greater New York City region. The pool features a terrace, garden-style games, and an outdoor bar serving craft cocktails and light fare by award-winning chef Andrew Carmellini.